Written by Alan R. Thrasher. Traditional Chinese instrumental music can be divided into several quite different domains, each with regional subtypes and repertoires. Most prominent are: a) qin 琴 (7-string zither), zheng 箏 (large bridged zither), pipa 琵琶 (lute) and other solo instrumental genres; b) the regional sizhu 絲竹 (‘silk-bamboo’) chamber music traditions; and c) the mostly outdoor chuida 吹打 (‘blowing and hitting’) genres. The solo genres are reasonably well known to Chinese and Western audiences because these virtuosic repertoires have been ‘nationalized’ and also well recorded on LP and CD formats. The chuida traditions, performed on louder wind instruments, gongs and drums, are largely associated with funerals and other ritual events. They are not well known outside of their regions due to relatively low entertainment value and poor representation in recordings. Jiangnan sizhu 江南絲竹– largely based on 19th-century melodies from various sources (e.g., folk melodies, pipa suites), Jiangnan ‘silk-bamboo’ music is a small but popular ensemble tradition from the Shanghai region and southern Jiangsu province. Chaozhou xianyue 潮州弦樂 – locally believed to be very old, this string-based ensemble music from Guangdong province is drawn from the qupai 曲牌 tradition, melodies circulated through Beijing opera and other sources. The nearby Hakka sixian 客家絲弦 (‘silk string’) music from the interior of Guangdong province is closely related. Minnan nanyin 閩南南音 – locally believed to be ‘classical’, nanyin (‘southern tones’) ensemble music is the chamber tradition of the Minnan people in southern Fujian province; also known as nanguan 南管 in Taiwan and elsewhere. Cantonese yinyue 音樂 – almost entirely a 20th-century repertoire, and largely composed, Cantonese music is popular among Cantonese speakers in and around Guangzhou, Hong Kong, Singapore and Chinatowns of the western world. Historically, there has been cross-fertilization among these culture areas, especially pronounced between the Chaozhou and nearby Hakka peoples, where many melodies, modes and instrument types are shared. Cantonese music has also received musical instruments and melodies from both Chaozhou and Hakka sources, and more distantly from the Shanghai region (due to movement between the urban cities of Shanghai and Hong Kong). Interestingly, the Minnan tradition has remained surprisingly insular –surprising because of the close linguistic and cultural relationship with neighbouring Chaozhou culture. Minnan music appears to have closer ties to traditions in North China (e.g., xiansuo 弦索 music of Shandong province and Xi’an guyue 西安鼓樂 of Shaanxi province). 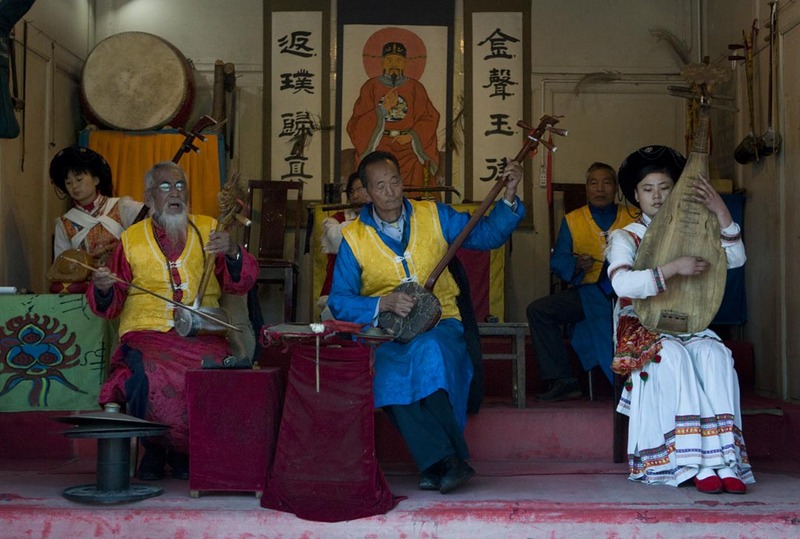 Among Chaozhou, Hakka and Minnan musicians, there is widespread belief that their music preserves styles and practices dating back to the Tang dynasty (618-907). This belief comes out in casual discussions, but references are also found in printed program notes as well. In fact, some terminology, melody names and aspects of instrument design can be traced to Tang written sources and drawings, but there is no evidence of these musical traditions (in their present forms) appearing before the early Ming dynasty (1368-1662). On this question of dating, there is general agreement among scholars that sizhu music emerged roughly 700 years ago, which coincides with the early Ming period. Images of the great Tang dynasty, however, remain in the hearts of musicians. Of greater reliability is the belief that these conservative traditions (Chaozhou, Hakka, Minnan) reflect the values of Confucian and other ancient ideologies. Confucian ideology is well known among scholars who have read classics such as the Xunzi 荀子, Liji 禮記 and other ancient texts. The positive and negative effects of music are frequently cited in these texts, since music was seen as an essential part of government theory. As stated in the Yueji 樂記 text, ‘music harmonizes the people’s voices (yuehe minsheng 樂和民聲), demonstrating the fact that music was viewed as a tool to encourage social harmony and a stable society. These and other concepts were passed on by the new Confucians during the Song dynasty (960-1279) and they subsequently became foundational concepts within Chinese society. Musicians in the conservative cultures of South China are very aware of the nature of these ideals and values – if not actual quotes in the old texts. For example, Chaozhou and Hakka musicians say that their chamber music reflects the spirit of the Confucian scholar (rujia 儒家), ‘encouraging social harmony and peaceful hearts.’ Similarly, Minnan musicians in Taiwan tell me that nanyin 南音 (nanguan 南管) is ‘a noble music, capable of encouraging a good society.’ Indeed, musicians from all three cultures say their refined chamber music is ‘music of the (Confucian) literati’ (ruyue 儒樂). To what qualities does the term ruyue refer? A number of interpretations are possible: a) the tempo must be slow (in reference to measured behaviour); b) the tonal system must be structurally pentatonic (do-re-mi-sol-la), reflecting the old ideal of an ‘elegant music’ (yayue 雅樂); c) music is for personal entertainment and self-cultivation (but not for financial gain); and d) the overall function of music is to encourage upright behaviour, higher thought and ‘social harmony’. That ‘social harmony’ (xiehe 諧和) was identified is significant, since this suggests a sense of ‘concordance’ or social agreement – a mainstream Confucian goal. Confucianism itself has undergone not-always consistent interpretations since the historic revivals of the Song dynasty and early 20th century. For these musicians, however, musical performance has continued to be Confucianism in action, as they understood it. Alan R. Thrasher, professor emeritus at the University of British Columbia, has made numerous field trips to China, Taiwan and Hong Kong for research on Chinese music and musical instruments. Dr. Thrasher has published and edited five books, the most recent including Sizhu Instrumental Music of South China: Ethos, Theory and Practice (Leiden: Brill, 2008), Yueqi: Chinese Musical Instruments in Performance (Vancouver: BC Chinese Music Association, 2011) and Qupai in Chinese Music: Melodic Models in Form and Practice (New York: Routledge, 2016). Among other publications, he has served as coordinator and contributor for China entries in The Grove Dictionary of Musical Instruments, 2nd edition (New York: Oxford, 2014). Image Credit: CC by Steve Evans/Flickr.